1 Imagine a make-believe land. A king lives in a castle. A queen and prince live there too. A tiger named Daniel lives in a clock. An owl and a pussycat live in a tree. A funny little lady lives in a spinning museum. A cow is a school teacher. They are all friends. They are all puppets. They live in Mister Rogers' "Neighborhood of Make-Believe." 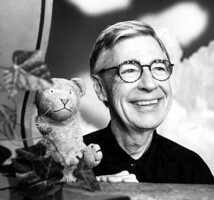 2 Fred Rogers was born in 1928. He was born in Pennsylvania. He was a creative child. He liked to use his imagination. His grandfather got him interested in puppets and music. 3 Fred's parents were caring people. They wanted to help children. When Fred was eleven years old, his parents adopted a child. Her name was Elaine. His parents became foster parents to a boy. His name was George. George's mother had died. He did not have anyone to take care of him. The Rogers family became his family. Fred thought of George as his brother. Later, George taught Fred how to fly an airplane. 4 In 1946, Fred went to college. He went to Dartmouth College in New Hampshire. Then, he went to school in Florida. He met his wife there. Her name was Sara. They had two sons. 5 Fred was planning to go back to school. He wanted to become a minister. He decided to do something else. He saw television for the first time in his parents' home. He was shocked. He did not like what he saw. He said, "I went into television because I hated it so." He thought that he had a better message to share. He wanted to share it with children. Feedback on "Won't You Be My Neighbor?"